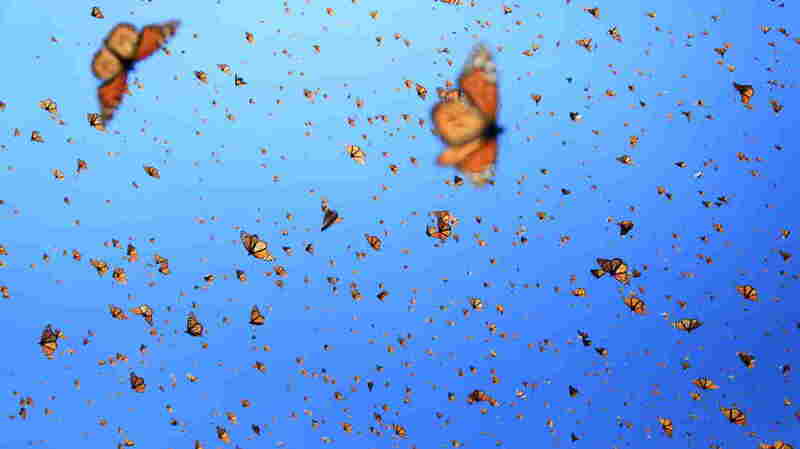 'Flight': A Few Million Little Creatures That Could More than 30 years ago, a couple answered a scientist's newspaper ad — and spent two years searching for a monarch butterfly sanctuary in Mexico. The new IMAX film Flight of the Butterflies chronicles how they helped solve the mystery of the monarch's migration. A young boy in Canada wondered where butterflies go in the winter — and spent 40 years trying to answer that question. In 1973, Dr. Fred Urquhart — all grown up by then — placed an ad in a newspaper in Mexico looking for volunteers to tag and observe butterflies and find their destination. A woman named Catalina Aguado and her American husband, Kenneth Brugger, answered that ad. They spent two years searching in remote parts of Mexico. "We were free-spirited, both of us, and we loved the adventure, so we never felt discouraged," Aguado said. "We had a jeep, we used a motor home, we went on horses. You know, a very difficult task, but we loved the idea." Finally, she and her husband came upon a sanctuary in the forest, where they found of hundreds of millions of butterflies. "I just called at him, 'I see them! I see them!' And of course, after that, we went silent," Aguado remembers. Now, more than 35 years later, documentarian Mike Slee has written, produced and directed Flight of the Butterflies, a 3-D IMAX film about the migration of the monarch to sanctuaries like the one Aguado and Brugger came upon in Mexico. "What you see, you can't imagine nature ever being like this," Slee says. "Trees that are draped — that are made, almost, of butterflies. It's got a surreal, supernatural feeling to it. It sends a sort of tingle up your spine when you see it in 3-D. And then they wake up and they all begin to fly." The migration of the monarch butterfly is a staggering natural phenomenon. It takes two or three generations for the creatures to make their way north to Canada — but then one "supergeneration" makes the 2,000-mile trip back to Mexico for the winter. And distance isn't the only thing the delicate creatures have to contend with. Inclement weather, deforestation and human threats like plows and crop-dusters also speckle their route southward. 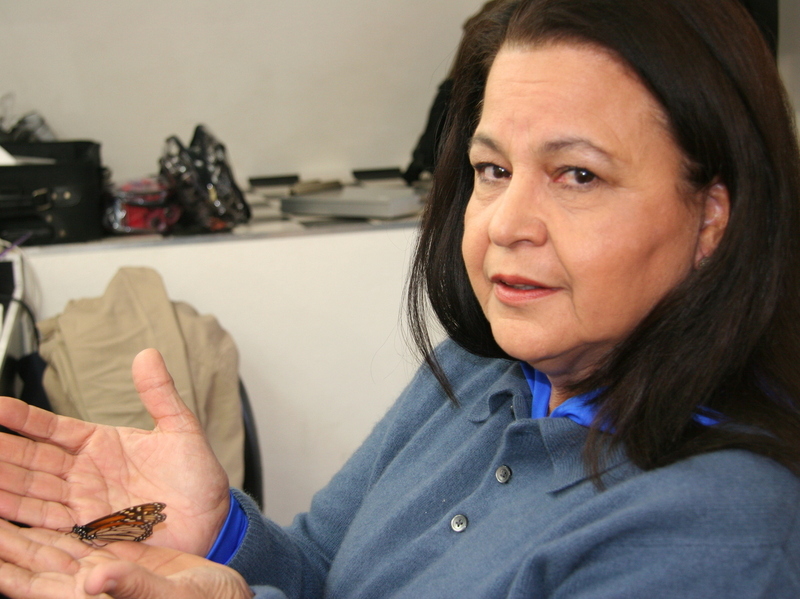 More than three decades have passed since Catalina Aguado and her husband discovered a monarch butterfly sanctuary in a Mexican forest — and helped solve the mystery of the monarch's migration. The filmmakers faced challenges of their own. Slee and his team considered balloons, helicopters and cables for filming. Ultimately, they used a 70-foot crane to get up close. "We can see the scales on the wings of the butterfly," he says. "We can see the punk hairstyle on the butterfly. And it's — for the scientists it's been amazing watching their reaction, because they've never been able to look so closely at the living animal." Aguado was transported by the experience of revisiting her quest in 3-D. She says this new film is able to communicate what her words never could. "After, what, 36 years? I can say wonderful, fantastic and glorious — and whatever other words, but I cannot describe the feeling. It was magical," Aguado says.